PMI-ACP, CSP & CSM Agile Exam Practice Questions & Training | Pass the PMI-ACP, CSP and CSM Agile Exams on your first try! Instant Access to Full Length Exams Starting at only $49. I used this service to study for the PMI-ACP and had no trouble passing the test. 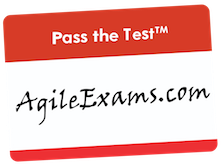 AgileExams™ is an online test preparation and study tool that provides practice exams to prepare you for PMI®’s Agile Certified Practitioner (ACP) Examination and ScrumAlliance®’s Certified ScrumMaster (CSM®) & Certified Scrum Professional (CSP®) Tests .